"The King needs an heir" is the theme behind this play, which exposes the intractable mixture of religion, politics, faith, loyalty, and love. The central figure of Sir Thomas More was played brilliantly by Jim Knight. Here was a man full of contradictions: of rigour, of integrity and of humanity; who was loved by the people but misunderstood by those in authority. We, the audience, deeply felt his pain and his indecision, right up to the time of his execution. The play’s author, Robert Bolt, remarked: "More is the great goalkeeper and the clean sheet he keeps is that of faith and integrity". Paul Scofield admitted it was the most difficult part he played. From top-left, clockwise: Ronnie Whitehead, Rodney Saunders, Colette Randall, Lucy Beevor, Jim Knight and Douglas Wragg. Rodney Saunders, The Common Man, was a lot more than just one character. He played the parts of about six different men with voices and accents to match, including keeping us in the picture as the scenes changed. What a versatile performer. The actress who most impressed me was Colette Randall. She so clearly got across to us her great love and frustration with her husband; she and her daughter, played by Lucy Beevor, almost had me in tears at his execution (which was well handled). Max Preston Bell, as Henry VIII, was quite clearly the man in charge, and lost his temper at just the right times. 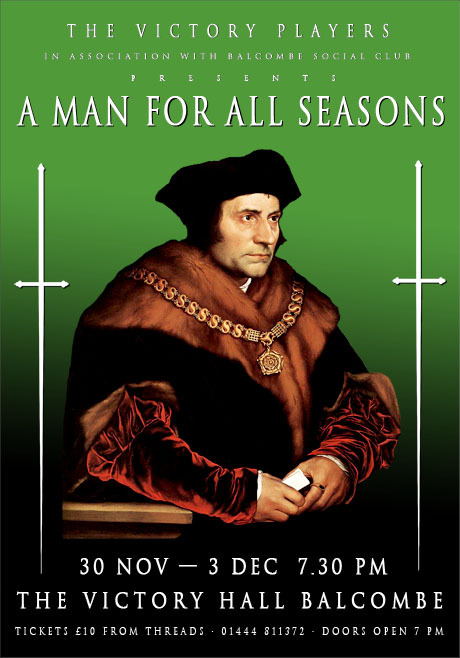 The other major parts were taken equally well by Douglas Wragg, as the well-meaning but untrustworthy Earl Marshal; Charles Metcalfe as the sanctimonious Cardinal Wolsey; Ronnie Whitehead, as the bullying, arrogant Thomas Cromwell; Greg Field as the slithery too-diplomatic Spanish Ambassador; and Jon Hunt as the creepy, untrustworthy youngster on the make. Nearly all of them were condemned to death in the end. Congratulations to all the actors, as well as those mentioned here. What difficult parts they had to learn, and how brilliantly they all performed, whatever their roles. Also very well done to those concerned with the costumes and scenery and the off-stage music and bells, and the lighting. All very Tudor in atmosphere. Finally, we must profoundly thank Director Keith Major and Producer Rodney Saunders. Like the audience, Paul Scofield would have been very impressed. 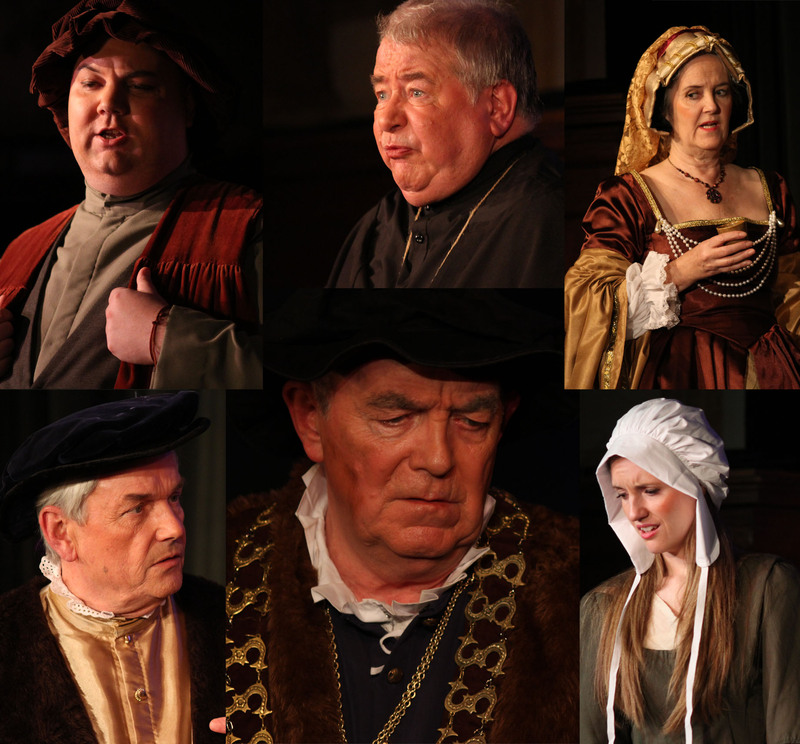 More photographs from this and previous productions are available on The Victory Players flickr site. Poster by Robert Saunders (with a little help from Hans Holbein the Younger).